As Condensation season approaches we are privileged to have Sam Dore, from Nuaire, providing the below guest blog. Sam discusses Condensation, and the solutions that Preservation Treatments can provide with the installation of Nuaire products. Condensation is one of the main causes of black mould growth within properties in the UK. There can be many causes for condensation dampness, but, the majority of the time, it is due to a lack of ventilation. Due to more stringent energy-efficiency regulations, we are providing better heating and insulation to our homes and installing new double glazing, often, without taking ventilation into consideration. This is where Nuaire provide the answer. In 1972, Nuaire developed a technology called Positive Input Ventilation or PIV. The PIV unit is mounted in the ventilated loft space and provides a steady stream of fresh, filtered air in to the property. This in turn dilutes and displaces the moisture laden air and replaces it with fresh filtered air, creating an environment where condensation does not occur. In October 2016 Nuaire launched our latest, innovative loft-mounted PIV range; the Drimaster-ECO. Our flagship model, the Dri-ECO-HEAT-HC incorporates a 400w heater to temper the incoming air passing through the sleek, circular diffuser mounted on the ceiling. The diffuser also houses the units’ controls (tamper proof where necessary), providing user-friendly commissioning. 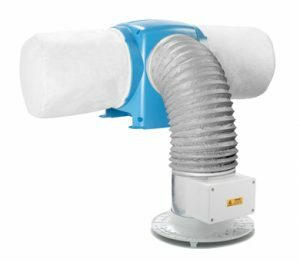 The heater position is unique to Nuaire, as it sits directly above the diffuser and therefore delivers the air at target temperature without heat loss down the duct, providing the end-user with savings of up to 20% versus our previous model. With this positioning, it also means the PIV unit can be suspended from the rafters so you obtain the benefit of solar gain within the higher points of the loft. The average loft temperature is 3oC higher than the outside air temperature so you are providing warmer air than your normal make-up air from natural leakage points within the property. With warmer, fresher, filtered air being supplied into the home, Dri-Eco provides a healthier living environment that can be free of condensation/mould. The G4 grade filters remove particulate to the size of pollen so are a great solution for allergy sufferers. For landlords concerned about their tenants keeping the unit running, a day run monitor is fitted as standard to ensure it is being used. This is accessed via the controls on the diffuser. Another advancement made in the development of the Dri-Eco was to install a RF module within it, which enables it to be paired to remote sensors and controls. The optional, wireless humidity sensor, when activated, will automatically boost the air flow from the Dri-ECO-HEAT-HC to dilute the moisture laden air within the property quicker. Manual boost switches are also available to provide the end user with hands-on control. For properties without loft spaces, Nuaire provide the Flatmaster PIV system. This unit works in the same way, but rather than drawing air from a ventilated loft space, a duct is run from the outside to the unit. Here, the fan draws the air through, filters it and then via another duct, distributes the fresh filtered air into the central hallway of the property. PIV can work as a whole house ventilation solution in certain properties, but where there is a room off the central hallway, such as an en-suite bathroom, an additional extract fan is required. For these scenarios, or ones where only an extract fan is required, Nuaire designed and manufactured the Cyfan. The Cyfan is a “one fan fits all” solution. Firstly, for those more electrically minded, it can operate as a 230v or 24v SELV fan, meaning it can be fitted in splash zones 1 & 2 which makes it less limiting in terms of positioning. The Cyfan is capable of operating as an intermittent or continuous running fan, depending on the application or end-user requirements. It has an integral humidity tracker, activated at a flick of a switch, which constantly monitors the relative humidity level and boosts the fan accordingly. As it only boosts as much as necessary depending on the humidity level, it will work as energy-efficiently as possible, providing the end-user with low running costs. In fact, a Cyfan fitted in a bathroom running continuously for 22 hours p/day and boosting for 2 hours p/day will only cost £1.38 a year! As with the Dri-ECO, for landlords’ peace of mind, the Cyfan has a day run monitor fitted as standard to ensure it is used. The Dri-ECO, Flatmaster and Cyfan are Nuaire’s core products for the preservation market, but they are not all we do. We manufacture MEV and MVHR systems as well as Twin Fans and Air Handling Units for commercial applications, all of which can be found at www.nuaire.co.uk.